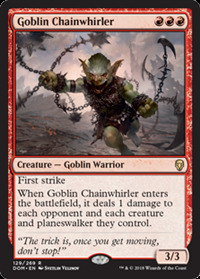 4/27/2018 If the damage Goblin Chainwhirler would deal to a player is prevented, it still deals 1 damage to that player’s creatures and planeswalkers. 4/27/2018 In a Two-Headed Giant game, the Goblin Chainwhirler’s last ability causes the opposing team to lose 2 life. Preorder of 4x here I come. Now to find a way to effectively give it deathtouch when it's ability triggers.